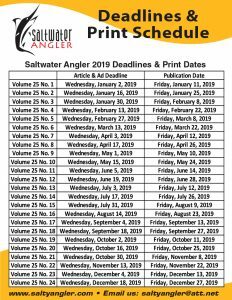 When you advertise in the Saltwater Angler fishing magazine, you’re in up to 50,000 hard-copies distributed monthly to over 900 storefronts across Texas and Louisiana. Locations include Houston, San Antonio, Austin, Corpus Christi, Kingsville, Victoria, Port Lavaca, Port O’Conner, Rockport, Port Aransas, Galveston, Freeport, New Braunfels, Seguin, and many more! Not to mention our loyal community of online readers in Texas, Louisiana, Florida, and other locations across the globe. We offer a variety of options for advertising – print and digital magazine ads, website, social media, email, and more. 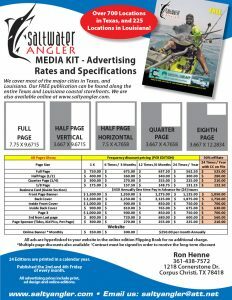 Check out our media kits for more info on magazine ads, and contact us to express your interest! 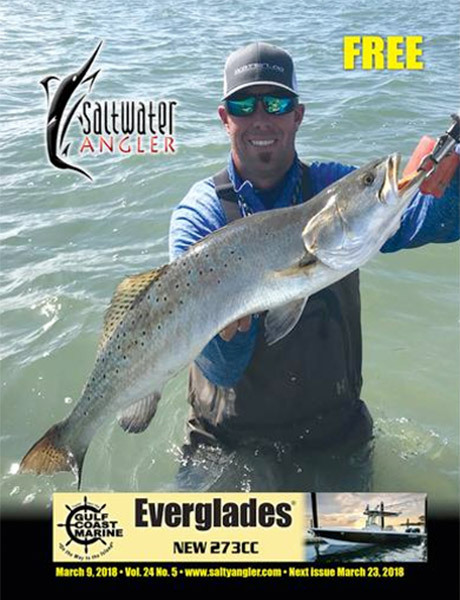 Interested in advertising in Saltwater Angler fishing magazines? Here are our current media kits.